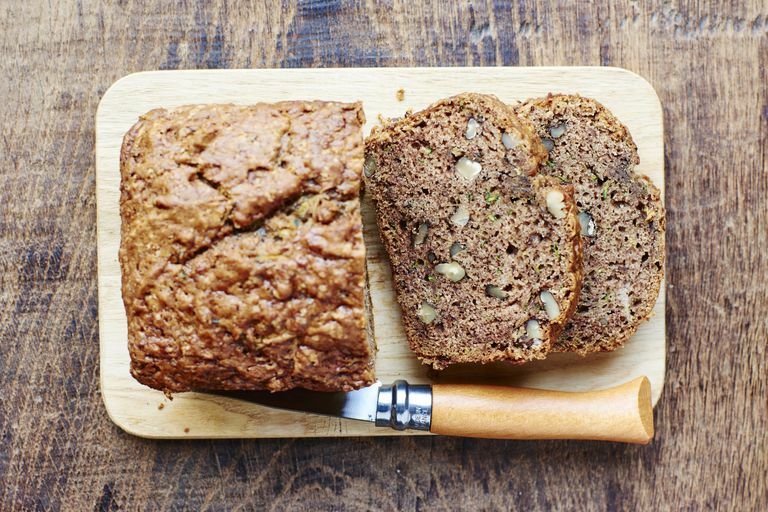 There are lots of variations for gluten-free banana bread including those using coconut flour. The problem with coconut flour is that it tends to soak up moisture from the air making the bread unpleasantly wet after two or three days. Almond meal seems to be the perfect solution. Some say bananas are a high-sugar fruit and not a good choice for a low-carb diet. You can use banana flavoring instead of real fruit if you like, but you're missing out on the fiber and valuable nutrients, like potassium, if you do that. Moderation is always the key. Lightly coat a 9x5-inch loaf pan with cooking spray and set aside. If you have a 2-cup liquid measuring cup, use it as this makes it easier to measure the wet ingredients. Roughly mash the bananas, and spoon into a 2-cup measuring cup. The banana should be about a cup, but the exact measurement isn't important. The main thing is that all the wet ingredients together will total 2 cups. Add the eggs and oil to your measuring cup. Stir with a fork to blend. Then finish filling the cup to the 2-cup line with water. In a medium bowl, whisk together almond meal, baking powder, and salt until well blended. Add the wet ingredients from the measuring cup to the dry ingredients and beat for 2 to 3 minutes or just until well combined. Don't over mix. Stir in walnuts. Pour the batter into the prepared loaf pan and smooth the top. Bake for 45 to 55 minutes, or until a toothpick inserted in the middle of the bread comes out clean. Remove from the oven and place on a wire rack. Cool for 10 to 15 minutes. Run a knife around the edges of the bread and invert it onto the rack. Turn bread on its side to cool completely before slicing. Muffin method: The dry ingredients and wet ingredients are mixed separately and then combined quickly. The fat is usually in liquid form like oil. This recipe is an example of the muffin method of quick bread making. Creaming method: In this case, the fat (usually butter or margarine) are whipped or creamed together along with the eggs until light and fluffy. Then the other ingredients are added. Biscuit method: Chilled fat, like butter or lard, is cut into the flour before liquids are added. Quick breads get their name from the fact that, since they are leavened with baking soda or baking powder (or both) instead of yeast, they are quick to prepare. It is believed that quick bread originated in the United States when chemical leavening agents like baking soda and baking powder hit the market in the 1800s. Quick bread soon became a busy rural housewife's favorite dessert because it took next to no time to make.